Save hours every week searching multiple websites, complicated TV guides and news articles - we are the only UK rugby union schedule aggregator! Aviva Premiership, European Champions Cup & Challenge Cup, Six Nations, Guinness Pro 12 rugby, Super rugby, French Top 14, Rugby World Cup, Currie Cup and much more from all freeview and satellite channels in the UK. If you enjoy watching the biggest rugby union teams regularly, you can select your favourite teams and customise your listings to show matches that are important to you. So, if you're only interested in the top 4 of the English Premiership such as Bath, Saracens and Sale, or the Guinness Pro 12 such as Scarlets, Ospreys or Leinster, the top teams from the Six Nations such as England, Ireland, Scotland and Wales or other International teams, you can choose these teams so that you'll only get the schedules for them, removing the rest of the clutter. 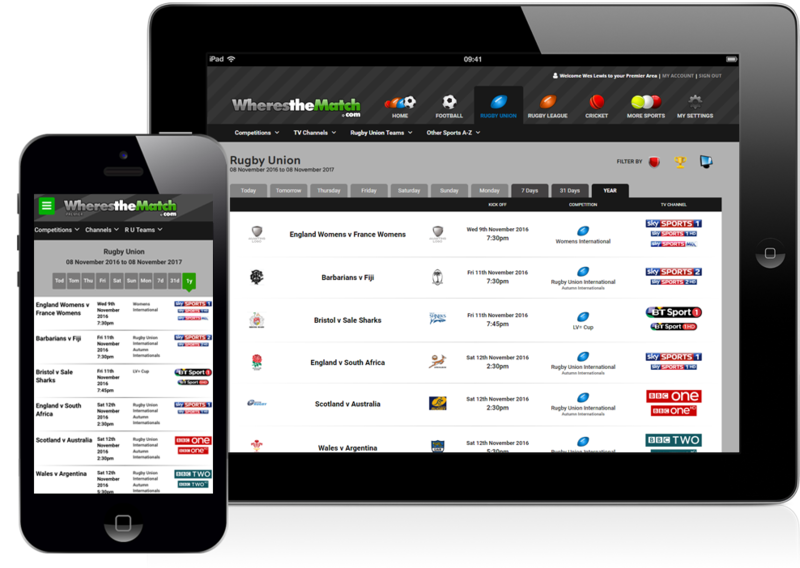 Also included in your upgrade you will get access to powerful features that will help you refine your rugby union schedules even further. You'll have the option hide all non-televised Rugby Union matches from your schedules, choose your Channels to remove TV stations you don't have, or select the rugby union competitions that you enjoy watching the most so that you only see live matches that are important to you.